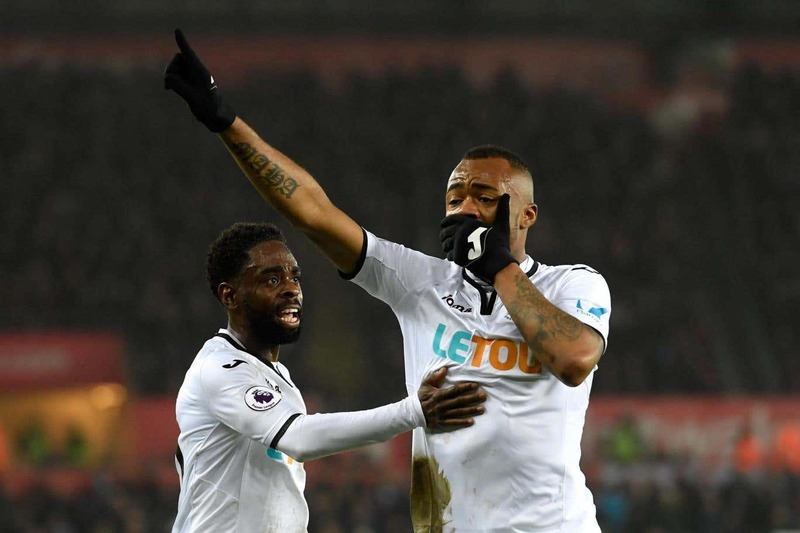 But substitute Jordan Ayew rescued a point 13 minutes from time with a thunderous 20-yard drive – his second goal of the season, with his previous Premier League strike coming against Palace at Selhurst Park in August. 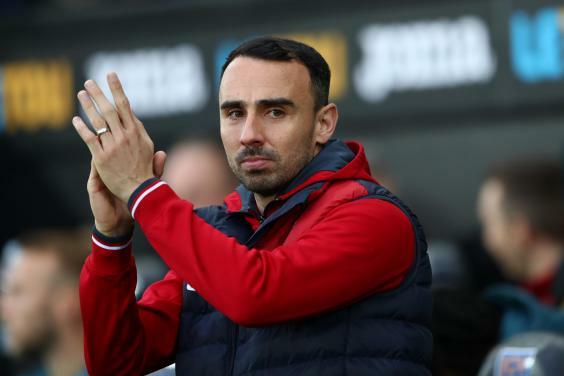 Britton – half the age of Palace boss Roy Hodgson – oversaw a vastly improved display from a Swansea side who had scored only 10 goals in 18 games under Clement this season. The breakthrough came when Swansea conceded a third penalty in two games, Ruben Loftus-Cheek’s quick feet deceiving Federico Fernandez. Swansea’s first-half showing was a step up from recent games, but the familiar lack of cutting edge remained. 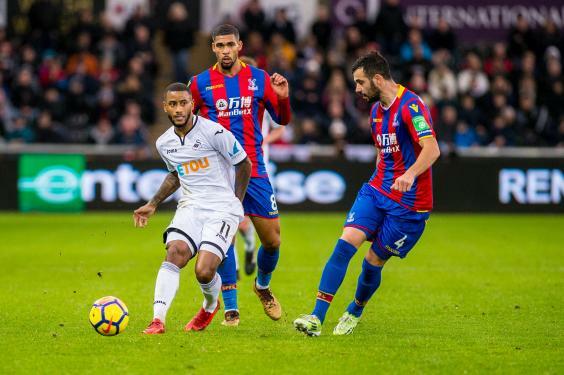 Luciano Narsingh offered the home side hope with some impressive bursts – and claimed in vain for a penalty when Jeffrey Schlupp got on the wrong side of him – but Swansea’s attacks petered out with frustrating regularity. Palace’s play in the final third was crisper with Wilfried Zaha, operating in a more central role with Benteke absent, at the heart of the Eagles’ best moments. 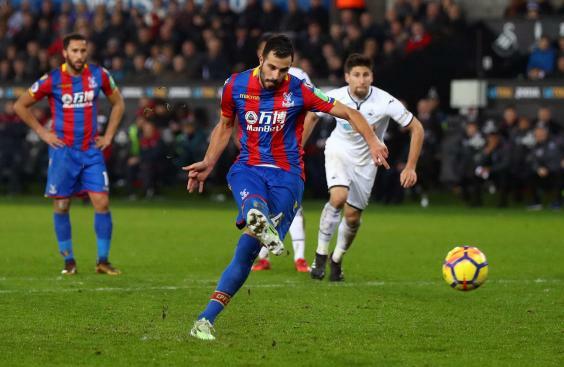 Lukasz Fabianski held Scott Dann’s header on his goal line before Zaha released Andros Townsend for a curled shot that was heading for the top corner until the Swansea goalkeeper produced a fine fingertip save. Loftus-Cheek was the next Palace player to go close and Zaha’s advance into the penalty area was only halted by an odd intervention from Fernandez, the defender heading clear while lying prone on the ground. Zaha then instinctively stuck out a foot to meet Townsend’s cross but the ball was directed wide. Speroni then had to move smartly again to shovel Nathan Dyer’s deflected cross off Schlupp wide. He had no chance of stopping Ayew’s rocket but Palace held on to extend their finest unbeaten record in the Premier League to eight games.